Food is major part of a child’s life. We are all victims of the food we ate as children and those flavors and traditions are inculcated into our very DNA. And still, we saw the end off the ham, cause it’s not Momma’s if the end is on it. Recently, I had a big discussion about strawberry shortcake. Most of my friends had shortcake made from Bisquick, those hard, crusty drop biscuits, split open and drenched with strawberries and syrup. As a child, I always wanted to have strawberry shortcake that included those garish yellow cakes from the grocery, baked with the shallow indentation to hold the strawberries. Of course, now, I would be appalled to eat those cakes. But, every once in a while, my Mother would buy those shortcake cakes and I was thrilled. When I though of strawberry shortcakes, however, I remembered that we had a large raspberry patch behind our house, so most of the time we had raspberry shortcake. 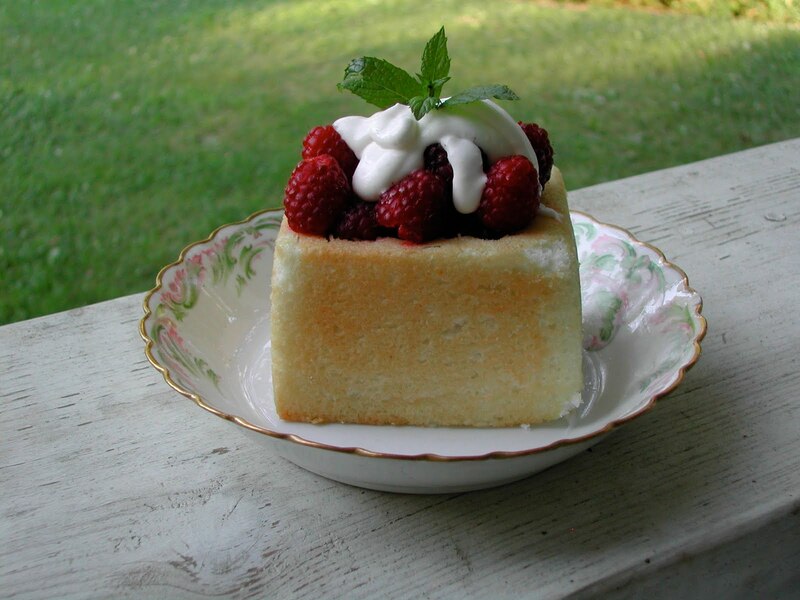 My great-aunt Ruth always made lighter than air, angle angel food cake for our shortcake base, and while my Mother never mastered angle angel food cake, there was a bakery in town that made angle angel food loafs. My mother would cut the loaf into sections and carve out a little box. She would fill it with raspberries and serve it with a sweetened, lightly beaten crème. I hadn’t though of those little raspberry boxes in years, but recently I was in Harris Teeter’s and in their bakery I found those same angle angel food loaves my Mother used for shortcake. Clearly, raspberry shortcake was in my DNA. It is also very yummy! Clearly SPELLING is not in my DNA. Anne, who kindly sends me an e-mails rather than commenting on the post reminds me it is ANGEL FOOD not ANGLE food. No matter what I do, I can't seem to differentiate those two words. In my brain they are identical. So if you go to Harris Teeter and ask them where the the ANGLE FOOD CAKE is they will just laugh at you. Lucinda, wonderful story and strawberry shortcake!! Yum, it does bring back those childhood memories! All purpose packaged baking mix was a go to for so many because the public was sold the notion buying a bag of flour and measuring salt and baking powder etc. was too time consuming -- a quality product was not the selling point --it was saving time. I don't enter the kitchen thinking I am going to save time. Heavens to betsey --people spend thousands and thousands of dollars on kitchens these days . I want to get my moneys worth, I am going to spend all day there if I have to.